A very widespread species in both Central and South America. It’s been recorded in Mexico, Guatemala, Venezuela, Suriname, French Guiana, Trinidad and Tobago, Ecuador, Peru, Brazil, Bolivia, Paraguay, Uruguay and Argentina. Tends to inhabit sluggish or still waters and seems to prefer turbid environments. It’s also found in the deeper parts of main river channels, and in general can be considered a benthic (bottom dwelling) species. At least 72″ X 24″ X 24″ (180cm x 60cm x 60cm) – 680 litres, and preferably bigger. Decor isn’t critical, although it does appreciate plenty of cover. Large stones and pieces of bogwood, twisted roots, and live plants all look good. It’s also much more active under dim conditions, so either use weak lighting or add a layer of floating plants to diffuse the light entering the tank. Feed live and frozen foods such as bloodworm, prawns, earthworms, tubifex etc. Dried foods are not usually accepted. Small fish will be eaten, but it can be combined with other similarly-sized species in a big enough tank. Don’t keep it with anything too boisterous or aggressive or it might become withdrawn. Possible tankmates include large, robust cichlids such as Cichla or Geophagussp., larger Characins, Cyprinids, catfish and Loricariids and other species such as bichirs. It’s very territorial with conspecifics, though, and a massive tank would be needed to keep more than a single specimen. It’s not been bred in captivity, but some aspects of its breeding behaviour are known. It breeds during the wet season and is a paternal mouthbrooder with the male also building a nest, in which he broods and protects the eggs and fry. Not a good beginner’s species, due to its very respectable adult size, but it makes a stunning oddball addition to communities of larger fish. It’s sensitive to many aquarium medications, particularly those containing copper. The genus Gymnotus has undergone considerable taxonomic revision in recent years, with over 20 new species being described since 1994, including several that were originally considered to be G. carapo. The systematics of the genus are still not fully understood, and it’s likely that the massive natural range quoted for this species will turn out to be far more restricted in the future. 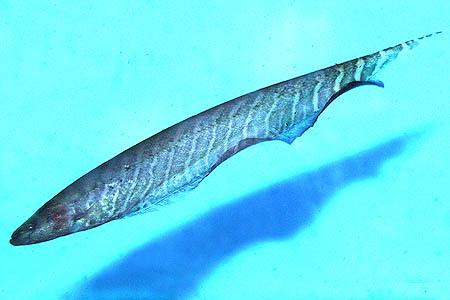 This probably also explains the variablity in colour and patterning of fish imported under the name “carapo knifefish”, and the influx of new and interesting variants onto the market over the last few years, such as the stunning tiger knifefish, G. tigre. Like other Gymnotids, it produces a weak electric field using specially-adapted muscle tissue located towards the tail. 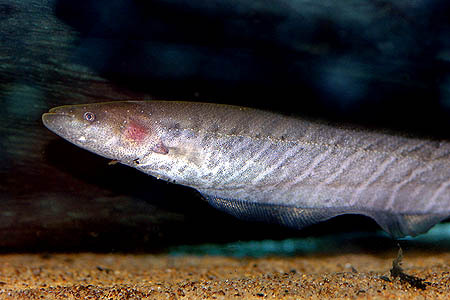 It also possesses electroreceptors, which allow the fish to receive electrical signals. With these, the fish can sense the tiniest of movements as the field around it is disturbed, and navigate in total darkness, useful skills when hunting prey or avoiding predators in the dark. What’s most fascinating about this adaptation is that the fish also use it to communicate with each other and find partners. It also has a modified swimbladder that acts as an accessory breathing organ. This allows the fish to survive in polluted or hypoxic (oxygen-deficient) environments, and also comes in useful when waters recede at the end of the wet season if the fish becomes stranded, for example.